MANILA, Philippines (2nd UPDATE) – Twenty-seven years after the EDSA Revolution, the son of democracy icons honored Martial Law victims not just in words but through a law that recognizes their suffering. President Benigno Aquino III commemorated the 27th anniversary of the EDSA People Power Revolution by hailing the Human Rights Victims Reparation and Recognition Act of 2013, a law he signed on Monday, February 25. “Hindi nagtatapos sa pagugunita ang ating krusada para sa katarungan. Kaya nga po sa araw ding ito nilagdaan natin ang Human Rights Victims Reparation Act of 2013 – bilang pagkilala sa pagdurusang dinaanan ng napakarami noong Batas Militar, at upang ipakitang lumipas man ang henerasyon, hindi tayo panghihinaan ng loob sa pagtatama ng mga mali ng nakaraan,” Aquino said in a speech at the People Power Monument in Quezon City. Under the law, some P10 billion funds recovered from the late dictator Ferdinand Marcos’ Swiss bank accounts will be appropriated for victims’ reparation. Eighty percent of the amount will be spent for existing claims and 20% for future ones. The law also creates the Human Rights Violations Victims’ Memorial Commission. “The commission is mandated to work with the Department of Education and the Commission on Higher Education to educate young people about the abuses committed by the Marcos regime and the heroism by those who opposed it,” the Palace said in a statement over the weekend. In his speech, Aquino thanked the Senate and House leadership for shepherding the passage of the law. He also acknowledged the authors of the law: Quezon Rep Lorenzo “Erin” Tañada III, and Sen Sergio “Serge” Osmeña III. The two and their families fought the Marcos dictatorship, and sought justice for the victims. In paying tribute to the human rights victims, Aquino said it is necessary to recall the scars of Martial Law. “There are those who were abducted in the middle of the night; those imprisoned without a word; the victims of theft, torture, and killings; the suffering of so many while a few benefitted,” Aquino said in Filipino. Aquino said this was the rationale behind the Memory Museum that government plans to build: to recognize and to give importance to the victims of Martial Law. The President spoke before an audience that included Vice President Jejomar Binay, former President Fidel Ramos, Speaker Feliciano Belmonte Jr, and Human Rights Chairperson Loretta Ann Rosales. The event marked the 27th anniversary of the 1986 EDSA People Power Revolution, a peaceful uprising that ended the 20-year Marcos regime, and led to the installation of Aquino’s mother, Cory, as president. The President’s father, the late Sen Ninoy Aquino, was a staunch critic of the Marcos regime and was assassinated in 1983. His death galvanized Filipinos to fight the dictatorship. Aquino’s allies in Congress hailed the enactment of the law. Sen Teofisto “TG” Guingona III, a co-author, said the law recognizes the heroism widespread during Martial Law. “It is only when we remember the atrocities, the injustice, and the abuses that went on in our past that we, as a nation, can continue to fight against attempts to resurrect these evils. Our memory of Martial Law, kept alive and strong, will ensure that we will never have to suffer the same fate ever again,” Guingona said in a statement. Sen Francis Pangilinan echoed the message. Sen Francis Escudero, sponsor of the Senate version, said the law was unique, the first time that a state recognizes a previous administration’s abuse on its citizens through reparation. “The expanded coverage of the law includes not only monetary compensation but also non-monetary benefits such as social and psychological assistance on victims of atrocities through different concerned government agencies. Instead of merely calling it compensation bill, we now call it the reparation bill,” Escudero said in a press statement. The Armed Forces of the Philippines (AFP) also expressed support for the bill’s enactment and implementation. “All developments and moves towards the attainment of truth and justice for our people are always welcome,” the military said in a statement. In his speech, the President stressed that the message of EDSA is that Filipinos can go beyond crab mentality and personal interest. The President said 27 years ago, the world admired the Philippines for People Power, inspiring similar peaceful revolutions abroad. He said the country again gains recognition, this time for economic gains. Aquino said it is not enough for the Philippines to rise from the dark chapters of its history but it must also move forward. 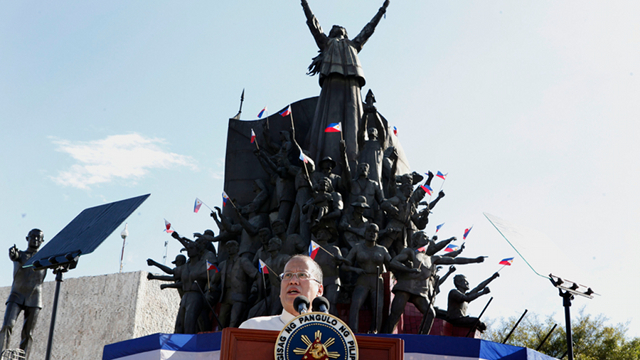 Aquino called on Filipinos to use the spirit of EDSA to look ahead.